It’s back – but it’s slimmer, all touch-screen and will wire up to your TV. 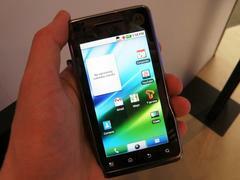 The Android Motorola Milestone XT 720 has had a few updates and will coming out in the UK in the next few months. The camera has been ramped up significantly – it’s now 8 megapixels, has an xenon flash and shoots high definition video. To support the video the memory has been specced up too with an 8gb micro-SD card onboard which can be upgraded up to 32GB. Allowing you to store those short films you make. An HDMI-out port allows you to pump HD content straight from the phone to a TV. Otherwise it will be shipped with Android 2.1, the latest version. It won’t feature the social-networking friendly MotoBlur interface- going for a cleaner simpler UI. The handset will only be available over the internet on the UK, on Expansys and Play.com, with pre-order beginning on 11 June. There’s no word of when it will be out in the States. According to TechRadar, Motorola are skipping high street stores and going for internet sales because it ‘allows it to get to the market faster’ as the rapid development of Android devices means it’s hard to synchronise with the network’s 18-month release cycles.